Wireless scanner for tablets, smartphones, and computers. Wirelessly scans via Wi-Fi directly into your tablet, smartphone, or computer. Works with iPad, iPhone, iPod touch, Kindle Fire™ HD, Android® devices, Windows Phone, Mac OS X, Windows 8, and Windows® 7 PCs. Creates its own Wi-Fi network—no internet connection needed! 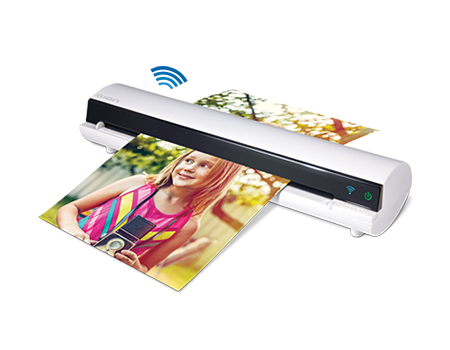 Scans any photo, business card, or document up to standard legal size (8.5" x 14"). App provides real-time preview while scanning. Scans save as JPEG or PDF files on your device. Compact, portable design for use anywhere. High-resolution 600 DPI scanning. Free scanning app included*. Built-in rechargeable battery. Scan documents and photos into your tablet, smartphone, or computer instantly with Air Copy from ION. Air Copy is an ultra-portable Wi-Fi scanner that gives you the freedom to scan any photo, business card or document up to size A4 directly into your tablet, smartphone, or computer. Air Copy is sleek in form and function. It's the perfect companion on the go: compact enough to fit in your messenger bag, briefcase or backpack, and incredibly easy to use. With high-resolution 600 DPI scanning, Air Copy scans a document or photo onto your tablet, smartphone, or computer in seconds and ensures you won't lose any quality during the process. Its free scanning app even allows you to view your scan in real-time on your device's screen. You get to watch as your documents and photos are transformed right before your eyes—Air Copy actually makes scanning fun! And with no cables to worry about, set up is clean and easy.